iTablaPro – Tabla Tanpura Player for iPhone is a musical app that let’s you play the tabla, an Indian percussion instrument. It is widely used in Hindustani music as a solo instrument or as an accompaniment in vocal or other instrumental music. The instrument has two pieces, the left part also called baya produces heavy bass and the right part called the data produces the main percussion sound. iTablaPro is the electronic digitized version of the original tabla imbibed with all the technicality needed to sound just like the original. iTablaPro for iPhone has six instruments packed into one. Apart from tabla, you can find 5 string Tanpura, a shruti box, a Swar mandal and a manjira. All these instruments are controlled by the same set of pitch controls. The app uses the sound samples of the real instrument and hence it strives to sound more realistic. All the 44 taals used in Hindustani music is available with multiple variations for each. The integrated auto tuner helps you tune any other musical instrument. You can live stream directly to other apps that are audiobus compatible. The add-on karaoke feature lets you record your using the device microphone and you can combine it with the instrument music. Music and songs recorded in the app can be shared to other apps or sent via mail. There is support for auto play of bhajan taals. Wide range of pitch and tempo are available that can be customized based on taal. Double tap the sliders to get a popup pocket wheel for easier control. The app costs $27.99 to download from iTunes. 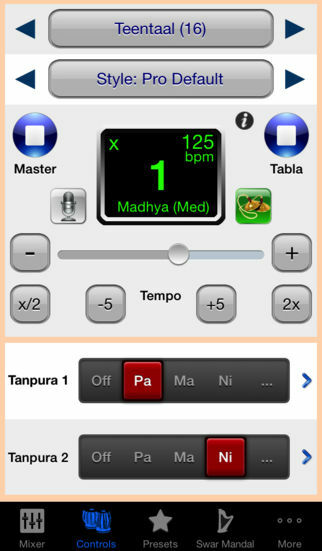 iTablaPro – Tabla Tanpura Player for iPhone is ideal for Indian classical music that supports all the common taals used in Hindustani music. It is a universal app that works well with all versions of iPhone and iPad. In terms of quality, this app reeks in a lot of appreciation with an excellent sound that is near to the original. The app easily allows you to operate on most of the controls that is commonly required with a few taps.